Since May 2013 I have been working with Sharepoint 2013.I have been coming across new things almost everyday.Recently, I had to add a URL link to navigation menu which redirect users to a folder on the network. 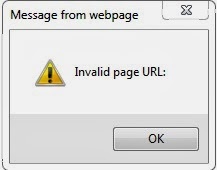 On the SharePoint 2013 site based on team Site template, when a user clicks on left navigation links pointing to a file share he gets the error "Invalid Page URL:". The problem is this was working on SharePoint 2010 and I tested this in a 2010 environemnt and it was still working. I tested the same by pasting the location in Internet Explorer and it opens up. I had opened a ticket with Microsoft which was actually identified as a bug with Sharepoint 2013.This issue has been fixed with December 10, 2013 Cumulative Update for SharePoint 2013. I am getting this error message in the Promoted Link Tiles itself. In the left navigation its working though. Also I am able to verify the address while adding it in the promoted links.